So I have been messing around with Leo-Pard at work; Some of its new features have been immediately useful, like the web-snippets doodad, which lets me embed a ruby regex tester right in my dashboard! Hmm, Warfish doesn't seem to scale? Try here instead. 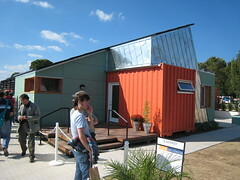 One of my favorites was the UC Boulder entry which incorporates a recycled shipping container. the future of murals is here. This morning 290 looked like a red metal licorice stick. A car was stalled at San Felipe on the south loop so I veered to the right and took the north loop to shepherd and took the scenic route to work. I cruised through the edge of the Heights, glided over I-10, got the green light at Washington near Adolph and Amber's place, was reminded of the Camera Co-Op, drove past my old high school, followed the bend past Allan Pkwy and around River Oaks, continued past Westheimer, Alabama and Richmond - under 59 and followed the tree-lined Binz to my daily parking spot next to the CAM. // Create imageBmp and attach the bitmap from the library. If anyone has any answes, i'm all ears. i am throwing this out there for comments - want to see how everyone is doing and all that jazz - nobody's been commenting lately - what's up with that - my excuse - i have been lazy - what's yours? I read this in the New Yorker and immediatly thought it sounded like something Killy would say. Kids are one hotter then grownups, so if a grownup is hot, a kid is very hot, but if a grown up is very, very cold a kid is only very cold." Elizabth and Carmen Sorensen @ 8 mos. Sometime at the end of this month, Liz and Taggart will have their baby. Carol and I are thinking about them a lot. 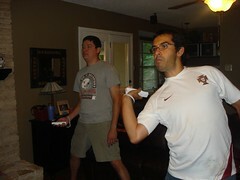 Things at the Chavez household are characteristically hectic and probably a little over dramatic. Our continued search for just the right meds for Adolfo and I continues; Carol is still searching for herself; and in about half an hour I am going to an interview for a position that may stave off my little family's certain economic collapse. Wish us luck.